Walk on the spicy side with this picante and poblano chili-spiked chorizo casserole. This Layered Chile Chorizo Casserole takes only 20 minutes to prep. Preheat oven to 350°F. Brown chorizo in large skillet on medium heat; drain. Add onions, garlic and adobo seasoning; mix well. Cook and stir until onions are tender. Stir in the picante sauce; simmer 5 min. Beat eggs lightly in medium bowl. Add sour cream and flour; mix well. Stir in the cheese. 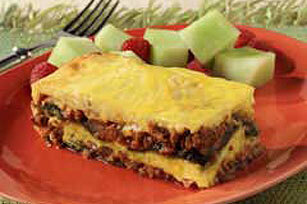 Layer half each of the chiles, sausage mixture and egg mixture in greased 8-inch square baking dish. Repeat layers. Bake 35 min. or until center is set. For a delightful brunch idea, serve this casserole with a seasonal fresh fruit salad. Prepare as directed, substituting ground beef for the chorizo and salsa for the picante sauce.